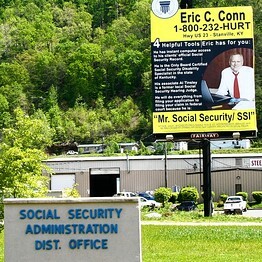 HUNTINGTON, W.Va.—Americans seeking Social Security disability benefits will often appeal to one of 1,500 judges who help administer the program, where the odds of winning are slightly better than even. Unless, that is, they come in front of David B. Daugherty. In the fiscal year that ended in September, the administrative law judge, who sits in the impoverished intersection of West Virginia, Kentucky and Ohio, decided 1,284 cases and awarded benefits in all but four. For the first six months of fiscal 2011, Mr. Daugherty approved payments in every one of his 729 decisions, according to the Social Security Administration. The judge has maintained his near-perfect record despite years of complaints from other judges and staff members. They say he awards benefits too generously and takes cases from other judges without their permission. Staffers in the Huntington office say he hears a disproportionate number of cases filed by one area attorney. Mr. Daugherty has been known to hold hearings for as many as 20 of this lawyer's clients spaced 15 minutes apart. Mr. Daugherty is a standout in a judicial system that has lost its way, say numerous current and former judges. Judges say their jobs can be arduous, protecting the sometimes divergent interests of the applicant and the taxpayer. Critics blame the Social Security Administration, which oversees the disability program, charging that it is more interested in clearing a giant backlog than ensuring deserving candidates get benefits. Under pressure to meet monthly goals, some judges decide cases without a hearing. Some rely on medical testimony provided by the claimant's attorney. This breakdown is one reason why Social Security Disability Insurance—one of the federal government's two disability programs—is under severe financial strain. It paid a record $124 billion in benefits in 2010 and is on track to become the first major entitlement program to go bust. Government officials said last week it is expected to run out of money in 2018. The U.S. program's tribulations come as other countries are trying to limit the costs of their disability programs. In the U.K., officials have proposed requiring routine re-evaluations of people with disabilities to see if their conditions have changed. Australia has proposed that some beneficiaries participate in job-training programs, with the goal of eventually moving them off government support. American applicants for disability benefits must first seek approval from state officials, who play a lead role in an initial review. Applicants twice denied can then appeal to one of the Social Security Administration's administrative law judges. The judges are appointed by the federal agency after a competitive exam and screening process. Hearings, which aren't open to the public because of medical-privacy rules, typically last an hour and include either the judge or the applicant's attorney questioning the petitioner. Medical or employment experts can testify, too. Judges consider an applicant's health, age, education and job prospects before making a legally binding decision. 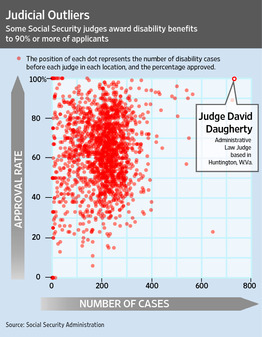 The average disability-benefit approval rate among all administrative judges is about 60% of cases. But there are Daugherty equivalents dotted across the country. In the first half of fiscal 2011, 27 judges awarded benefits 95% of the time, not counting those who heard just a handful of cases. More than 100 awarded benefits to 90% or more of applicants, according to agency statistics. Mr. Daugherty, 75 years old, processes more cases than all but three judges in the U.S. He has a wry view of his less-generous peers. "Some of these judges act like it's their own damn money we're giving away," Mr. Daugherty told a fellow Huntington judge, Algernon Tinsley, who worked in the same office until last year, Mr. Tinsley recalled. 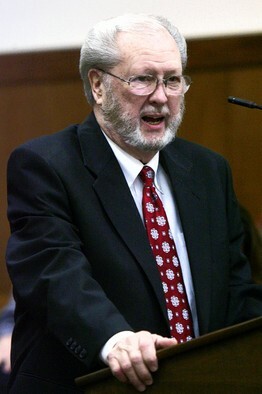 Judges and local attorneys have complained about the volume of disability cases brought before Judge Daugherty by one lawyer, Eric C. Conn.
Mr. Daugherty, in a written response to questions about the comment, said such a phrase is "more or less a standing joke" among disability-benefit review offices around the country. "No more, no less." He said every decision he makes "is fully supported by relevant medical reports and physical and/or mental residual functionary capacity assessments from treating or examining doctors or other medical professionals." When asked about Mr. Daugherty, Social Security Administration Commissioner Michael Astrue said in an interview there were several "outliers" among administrative law judges, but that he has no power to intervene because their independence is protected by federal law. Their appointments are lifetime. "We mostly have a very productive judiciary that makes high-quality decisions, and we've got some outliers and we've done what we can," said Mr. Astrue. "Our hands are tied on some of the more extreme cases." Social Security Administration officials acknowledge they are trying to clear a backlog of 730,000 cases. But they say they remain focused on ensuring taxpayer money isn't wasted. "We have an obligation to the people in need to provide them their benefits if they qualify, but we also have an obligation to the taxpayer not to give benefits to people who don't qualify," Mr. Astrue said. Following inquiries from The Wall Street Journal, the Social Security Administration's inspector general's office launched an investigation into Mr. Daugherty's approval rate, according to several people briefed on the matter. Mr. Daugherty said he isn't aware of any investigation. 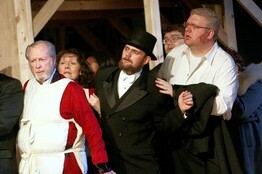 Judge Daugherty, left, an active member of the Huntington, W. Va., community, performed in a recent play. Social Security, with an $800 billion annual budget, is one of the government's largest expenses, and is best known for sending monthly payments to retired Americans. But it also pays disability claims for 18 million people each year, with numbers pushed higher because of the recent recession. The federal government runs two separate programs to assist people unable to work because of a debilitating mental or physical disability. For some, applying for benefits can be an agonizing process that takes more than two years. Benefits are modest—they can run around $1,000 a month—but come with access to government-run health plans Medicare and Medicaid. Analysts estimate the total package costs $300,000 over a beneficiary's lifetime. To clear the backlog of cases, the Social Security Administration in 2008 pushed judges to move between 500 and 700 cases a year, something less than half of judges were managing at the time, according to Mr. Astrue, the commissioner. To compensate, judges began making many decisions "on the record," which means they grant benefits to applicants without meeting them, hearing testimony or asking questions, according to several judges. This has been a favorite approach for Mr. Daugherty, people who have worked with him say. Mr. Daugherty doesn't dispute the characterization, and said in these circumstances he weighs "the evidence in the same manner as in cases requiring a hearing." He said the process "saves the agency a great deal of money and work hours." The Social Security Administration "cares only about number of resolutions; quality is no longer a serious concern," James S. Bukes, a Pittsburgh administrative law judge, wrote in a recent letter to the House subcommittee that oversees Social Security. Mr. Bukes, who approved 46% of disability applicants through the first half of this fiscal year, said the system "wastes millions of dollars by granting claims that are not meritorious." Mr. Daugherty became a Social Security judge in 1990 after serving as an elected Cabell County circuit court judge during he 1970s and 1980s. Born and raised in Huntington, he introduces himself as "D.B.," according to program notes for a recent local production of "Titanic: The Musical," in which Mr. Daugherty played John Jacob Astor. He's also a devotee of karaoke. "He is a very, very well respected man in the community," said Nancy Cartmill, president of the Cabell County Commission. "He's been there for years." In 2005, he reached 955 decisions, approving benefits in 90% of the cases. 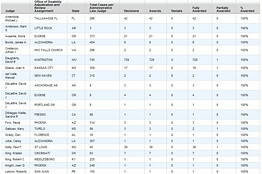 From 2006 through 2008, he decided 3,645 cases, approving benefits roughly 95% of the time. Last year, at 99.7%, he had one of the highest award rates in the country, and is on pace to award even more benefits in 2011, according to agency statistics. As Mr. Daugherty's numbers rose, judges, staff and local attorneys began complaining about the volume of cases brought before the judge by one Kentucky lawyer. The lawyer, Eric C. Conn, runs his Social Security practice out of a collection of connected mobile homes in Stanville, Ky., where he erected a giant statue of Abraham Lincoln in the parking lot. His smiling face adorns billboards up and down U.S. Highway 23, and his slogan is "he gets the job done." Mr. Conn hired Mr. Tinsley, the former Huntington judge, and promotes him on local billboards, too. Mr. Conn often brings an inflatable replica of himself to events. His website address is mrsocialsecurity.com. Judges and staff in the Huntington office have complained to supervisors that Mr. Daugherty assigns himself Mr. Conn's cases, including some that were assigned to other judges, two former judges and several staff said. Cases are supposed to be assigned randomly. According to a court schedule of Mr. Daugherty's day reviewed by The Wall Street Journal dated Feb. 22, 2006, Mr. Daugherty held 20 hearings spaced 15 minutes apart for Mr. Conn and his clients in a Prestonsburg, Ky., field office. Such days can be a bonanza for lawyers: The average fee for one approval is between $3,000 and $3,500 and can go as high as $6,000. "The Conn situation was something we really harped on," said Jennifer Griffith, a master docket clerk in the office until she left in late 2007. "We made sure management knew about it. We gave them every chance to come up with some sort of logical explanation or to get it to stop, and that never happened." Mr. Daugherty said he prefers a crammed timetable because he is dyslexic and must fit all of his hearings within four or five days each month because he "simply cannot spend that much time in the courtroom." Holding hearings within just a few days "allows me sufficient time to review and prepare for hearings, resulting in full and complete knowledge of the documents in the case prior to hearing," he added. Huntington's chief administrative judge, Charlie Andrus, said he was notified on four occasions of Mr. Daugherty either taking cases assigned to other judges or taking unassigned cases. Mr. Andrus said he issued a written directive on April 29 that "no case was to be reassigned between judges by anyone unless I gave specific permission." Mr. Daugherty said he believed judges could take cases "so long as no other [administrative law judge] had seen or reviewed the file." He said he was "recently reminded that that is no longer true and I promptly returned the cases to the original assignees." Stephen Sammons, 37, of Mavisdale, Va., said he injured his neck and back in a truck accident in 2001. He continued working until 2008 when the pain became unbearable, he said. He quit his job and filed for disability benefits. Several doctors authorized by the Social Security Administration to look at his injuries disputed his claim that his condition was caused by the accident. He retained Mr. Conn, and the case ended up before Huntington judge Toby J. Buel Sr., who rejected the claim in February 2010. Mr. Conn resubmitted Mr. Sammons' claim, and Mr. Sammons said he was surprised when Mr. Conn's office called and said he wouldn't have to appear before the judge and would only have to see a doctor, selected by Mr. Conn. The new medical records were filed to Mr. Daugherty, who approved the case without Mr. Sammons having to appear. Mr. Daugherty declined to comment on the case. A possible connection between Messrs. Daugherty and Conn is a subject of the inspector general's investigation, according to two people familiar with the probe. Neither Messrs. Conn or Daugherty have been accused of wrongdoing. Mr. Daugherty said he has "absolutely not" received anything of value from Mr. Conn or his associates for processing the lawyer's cases. He said he has denied a "goodly number" of Mr. Conn's cases over the years, though he couldn't provide a specific figure. Mr. Conn declined multiple interview requests, and didn't respond specifically to written questions. In a statement, he said he had "not been contacted by any one indicating any investigation being conducted." He added: "I have tried very hard in my 18 years of being a lawyer to represent my clients and the profession honestly and ethically seeking results based on the merits of my client's cases and the results that come from hard work and not from any improper conduct." Some former judges and staff said one reason Mr. Daugherty was allowed to continue processing so many cases was because he single-handedly helped the office hit its monthly goals. Staff members can win bonuses and promotions if these goals are surpassed as part of performance reviews. Dan Kemper, who began working as a judge in the Huntington office with Mr. Daugherty in 1990, said the Social Security agency's management refused to intervene because of the numbers Mr. Daugherty delivered for the office. He said he complained for years about the number of cases Mr. Daugherty approved without interviewing applicants. Mr. Kemper, who was known in the area as "Denying Dan" for his relatively strict approach, retired in 2007 because he felt the system was unfair. "The only way you could really get that many cases out was to grant them all, because it was so much easier," Mr. Kemper said. In late April, the Huntington office held 50 of Mr. Daugherty's cases—all approvals for Mr. Conn's clients—so they could be processed in May, because the office had already hit their monthly goal, people familiar with the matter said. Those applicants will have to wait an additional month to receive benefits. Mr. Conn, who receives a percentage of the back pay owed to his clients, will collect more fees because of the delay. The Huntington office will get a head start on the next month's target. Mr. Daugherty said cases are held to space out his approvals, which he attributed to "the 'numbers game' that most, if not all, federal agencies are subject to." Mr. Andrus said cases weren't held to meet monthly numbers. He said Mr. Daugherty's cases can be held because other applicants might have been waiting longer for benefits and those cases might take priority. In a brief telephone interview in April, Mr. Daugherty blamed high poverty rates especially in Eastern Kentucky for his large case load and high approval rate. "People would really be surprised at how little education those people have," he said. "If they have a fourth-grade education, they couldn't get a job if their lives depended on it."